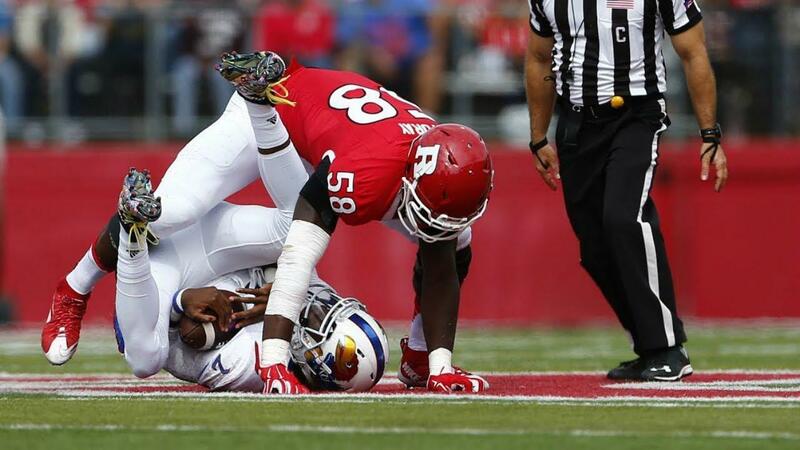 Prior to last week’s Senior Bowl, Rutgers EDGE player Kemoko Turay was far from a household name. Followers of the program were singing Turay’s praises, as were some EDGE gurus, but Turay had gone through the early stages of the draft process relatively unnoticed. That all changed during the Senior Bowl. Kemoko Turay put on a show all week: dominating 1 on 1’s and making his impact felt during the team periods. The New Jersey product weighed in at 6’4″ 252 pounds. And with 33 and 5/8th inch arms, Turay looks exactly how you want your weakside defensive end to look. As impressive as his Senior Bowl performance was, however, Turay’s tape at Rutgers is not nearly as consistent. Due to some injuries which set him back throughout college, as well as the Rutgers defensive scheme, Turay did not dominate on the edge as often as you’d like to see. Still, he flashed throughout the 2017 season and proved worthy of being drafted. Turay can win in a variety of ways. He is strong and precise with his hands which help him break the offensive tackle’s hands and rip around the edge. He is incredibly athletic around the corner, and shows off elite bend at times. Turay is a smooth athlete and knows how to use it to his pass rushing advantage. During the Senior Bowl he looked to use his length well, kept hands above his eyes, and won off the edge all week. Here’s a clip from the Senior Bowl where Turay is playing RDE. Turay gets a good get-off, rushes upfield and forces the offensive tackle to flip his hips early. This gets the tackle off balance rather than square. Then, Turay chops the tackle’s hands, dips his shoulder and bends around the corner effortlessly. This bend is special and his ability to bundle together moves will help him win at the next level as well. Against Washington here, we see Turay’s hand work in action. At the bottom of the screen Turay quickly chops the tackle’s hands and rips to his outside shoulder. Because of his strong and precise hands, as well as his quickness in hitting his moves, the tackle has no chance to recover once getting beat. While Kemoko Turay’s specialties are his athleticism, bend, and quickness, you shouldn’t underestimate his power. He showed off this power throughout the season as he does during this rep vs. Washington. This time against Ohio State we see Turay work on an inside stunt. Turay slowly comes around the tackle’s outside move, and the guard actually does a good job at passing off the defensive tackle and adjusting to Turay. Once Turay gets to the guard, however, he blows right by him with athleticism and quick hands. If you stop your feet when trying to block Turay, you’re going to get beat just about every time. Kemoko Turay is still somewhat raw as a pass rusher, but with the right coaching in the NFL I believe he can become a really productive EDGE rusher. There are concerns due to the lack of consistency in his college tape and because of struggles against the run, but I wouldn’t focus on those too much. If you’re drafting Turay, you’re looking for an athletic edge player with all the traits to become a damn-good pass rusher. Not someone who will be dominant against the run. Still, with time, he could become a 3-down defensive end in the NFL.